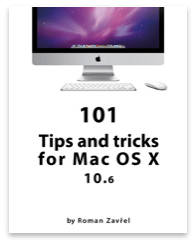 My buddy Roman Zavrel from the Czech Republic website www.letemsvetemapplem.eu has translated his book on Macintosh Tips and Tricks for 10.6 to English, and it’s now available in the iBookstore. Way to go Roman! Keep up the great work! This entry was posted on Sunday, May 8th, 2011 at 2:01 pm	and is filed under Uncategorized. You can follow any responses to this entry through the RSS 2.0 feed. You can leave a response, or trackback from your own site.